Gustav Markkula from the University of Leeds presented the paper “Models of human decision-making as tools for estimating and optimising impacts of vehicle automation” with a poster at the 2018 Transportation Research Board (TRB) Annual Meeting, that took place in Washington, USA on 7-11 January, 2018. This paper describes the early interACT WP2 work on quantitative modelling of road user interactions, showing that the models developed by the ITS Leeds team can qualitatively replicate behavioural findings from the literature, and demonstrates how these types of models can be used for optimising traffic flow and safety of automated vehicles. 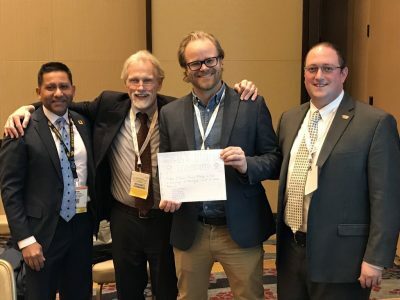 The paper won the Best Paper award of the Simulation and Measurement of Vehicle and Operator Performance Committee of the TRB, and has been selected for publication in Transportation Research Record: Journal of the Transportation Research Board.